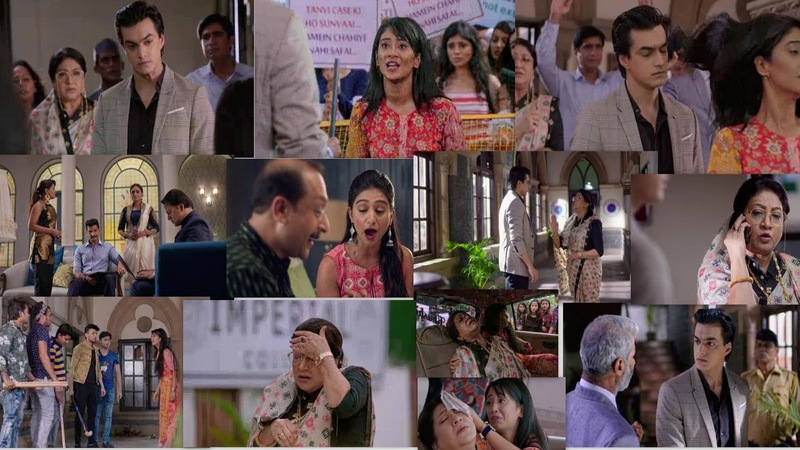 Home Yeh Rishta Kya kahlata Hai Yeh Rishta Kya Kahlata Hai 21st June 2018 Episode Written Update "Naira-Kartik confrontation Naira takes Dadi to Hospital "
Yeh Rishta Kya Kahlata Hai 21st June 2018 Episode Written Update "Naira-Kartik confrontation Naira takes Dadi to Hospital "
episode starts with Naira protests against the college authorities when she finds them dismissing the sensitive matter of Tanvi’s MMS. She wants justice for Tanvi. Dadi tells Kartik that Naira is initiating this protest. Naira tells them that she will protest and go on a strike till they catch the real culprit. Kartik tells her that they are trying to sort the matter by concealing Tanvi’s name. Naira doesn’t understand Kartik’s way of working. Suwarna worries when she fails to contact Dadi and Kartik. She feels Dadi is doing wrong to hide things from her. The family asks her not to make issues from petty things. Suwarna asks Manish to try calling the Dean and know the matter, if anything is wrong. Manish loses his temper and yells at her for making it a big issue. He asks her to think about others too. He shouts on Suwarna for her madness and goes. He gets too upset. Surekha explains Suwarna that the bad balancing in the family is breaking all the relations. She tells Suwarna that they may get away from her if she acts such mad for Kartik. She tells Suwarna that even Kartik will end ties with her some day. Suwarna gets worried. Kartik feels bad that Naira isn’t believing him now. He wonders how did she misunderstand him. Suwarna calls Kartik to know about his welfare. Kartik apologizes for not answering the calls. He tells her that he was busy in meetings and couldn’t answer the calls. He lies to her that everything is fine. Dadi asks Suwarna not to come, since she is with Kartik. She asks Suwarna not to throw tantrums. Suwarna justifies her love for Kartik. Dadi tells her that she knows motherly love well. She restricts Suwarna from too much interference. Kartik tells Dadi that he will talk to the students and sort the matter. Kirti takes Bau ji’s help and hires him as her online marketing officer. Bau ji gets happy and tells her that he will do the work soon. She wonders what’s Naksh hiding from them. The students take a wrong turn and attack on the college property to take the protest higher. Naira didn’t intend to do this. She asks the guys not to harm the property and just ask for justice for Tanvi. She tells them that they are doing wrong. The guys insult her for her boring lectures. Kartik gets mistaken seeing her with the guys. Naira tries to stop those violent guys. Devyaani talks to Naitik and expresses her annoyance over Kartik and Dadi. Naitik asks her not to worry for Naira. He finds Naksh upset and asks the matter. Naksh hides about the financial problems. He fails to balance family and work responsibilities alone. Tanvi asks Naira what’s happening, how can the students protest against the management for their personal motives. Manish calls Naksh to know about his financial problems. Naksh doesn’t disclose anything to him. Manish asks Naksh to meet him. Naksh meets Manish. Manish thanks him for not spoiling terms with him and Kirti because of the dispute between Kartik and Naira. He asks Naksh to share his problems with him. He knows Naksh is annoyed with Naitik to side with Naira. He tells him that Naitik’s decision was tough, but it was right for family’s happiness. He asks him not to stay annoyed with Naitik, as people have to upset family some times for the sake of family’s happiness. He offers help to Naksh to fill in Naitik’s place. Naksh promises him that he will manage everything on his own and not let Kirti face any trouble. Dadi gets to see a fight happening between college guards and students. Dadi gets injured in the incident. Naira gets a huge shock. She rushes Dadi to the hospital. Kartik asks the inspector to find the culprit by checking the video footage again. Kartik finds about Dadi’s injury. He gets upset on Naira and starts blaming her. Kartik Tries to Stop Naira they Fall in Pool Kartik Saves Naira in his arms Someone Makes their Video.